Survival is a much misunderstood word, and most times a mis-used word. It has taken on a more narrow meaning over the past 20 years - to indicate the taking-on of the natural world and 'to beat the odds' and tell the tale after battling with supposedly colossal natural forces or events. The latter may be true but it's mental, it's urban, it's personal, it's developmental in that we're always surviving - and not just in wilderness - not just in emergencies. Having said that our spin on survival is necessarily of the tactical and combat form; without melodrama it may be behind enemy lines or preparation for such. 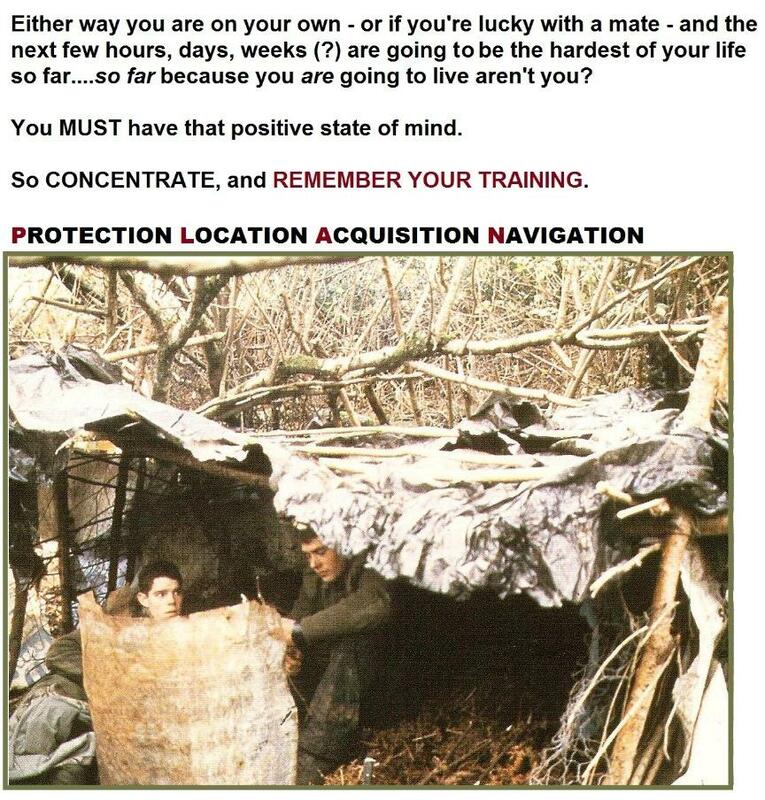 Combat survival is different from civilian survival; but learning how to survive without the pressure of being hunted, chased or shot at, is a useful place to start. When working at Commando Training Centre Royal Marines once I interviewed 52 potential Royal Marines during their Potential Recruits course - and asked how many had been camping before. The answer: 11.....and that came as quite a shock. To learn about 'survival' you could do a lot worse than start camping and backpacking in your teenage years with or without your Squadron. It teaches you a lot, not least of which is PREPAREDNESS.....ie being prepared. A survival situation is the unexpected result of a number of events. 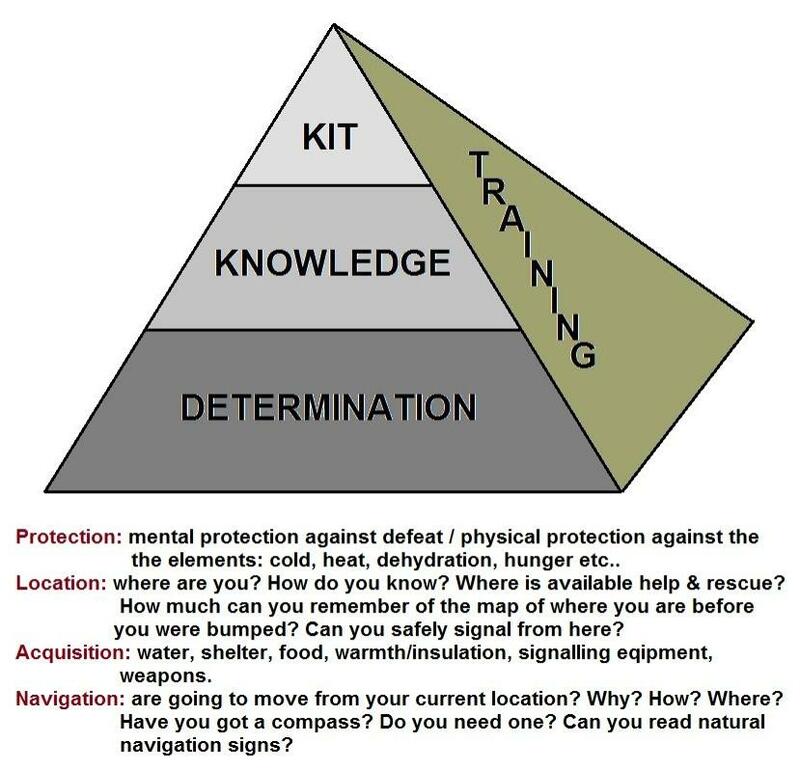 This situation will get better if you have TRAINED, if you have the guts, will, and DETERMINATION to see it through, keeping your head and common sense, and using KNOWLEDGE that you have learned, and any KIT that you have, by chance, or planning still have on you or close by, or you have found. There is also a large element of what the world calls 'luck' involved. 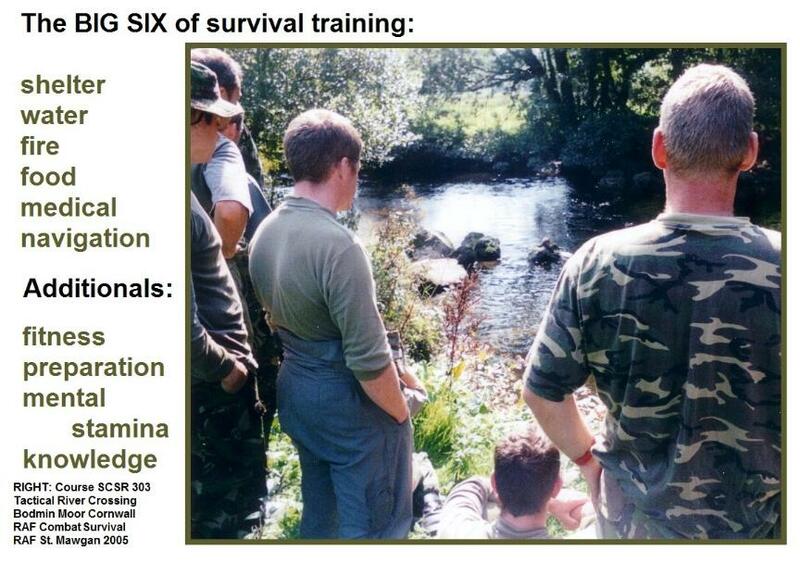 Time spent in training for a survival situation is never wasted. You will notice that a lot of the above is to do with skills learnt. One thing you must try to prepare yourself for is not to be so shocked at the event[s] which lead up to your forced survival that you are totally useless and ineffective - getting worse day by day instead of calmer, mentally stronger, and effective in the environment you find yourself in. 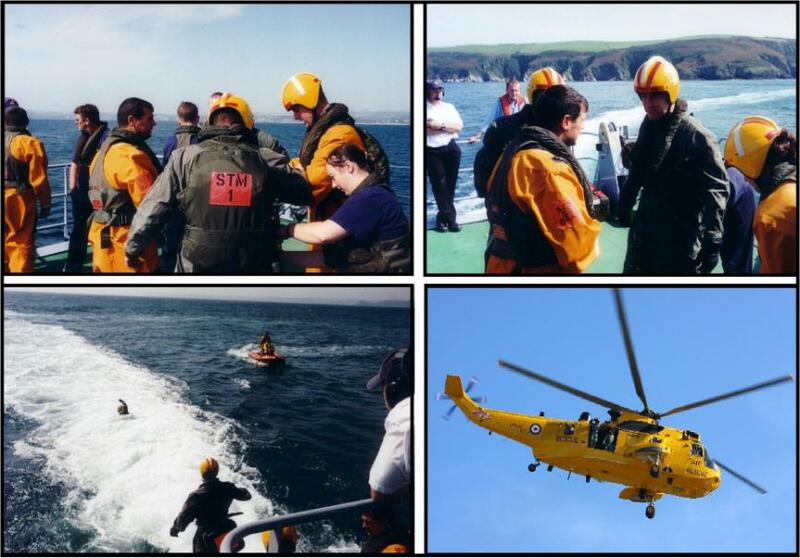 Fast jet pilots re-training to be Squadron-based Survival Instructors in the RAF, rotary-wing pilots on Sea King (then) HAR3 SARs going through sea-phase 'dunking' in the English Channel (below), and international NATO pilots cross-training from their host countries (above) ...all comes within the remit at RAF St. Mawgan, home to formerly the RAF School of Combat Survival & Rescue, now 'Survive, Evade, Resist, Extract ', the UK centre of excellence for this military intiative.